Constant current rating 1A but can peak at 3A for short periods. This DC to DC voltage converter has an output range between 50mV and 16V. The output voltage is adjusted up and down in approximately 50mV steps by 2 on board push switches. The maximum continuous current rating is approximately 1A at 16V but can peak up to 3A for short periods. This unit has a built in back lit LCD display which shows the output voltage and current. 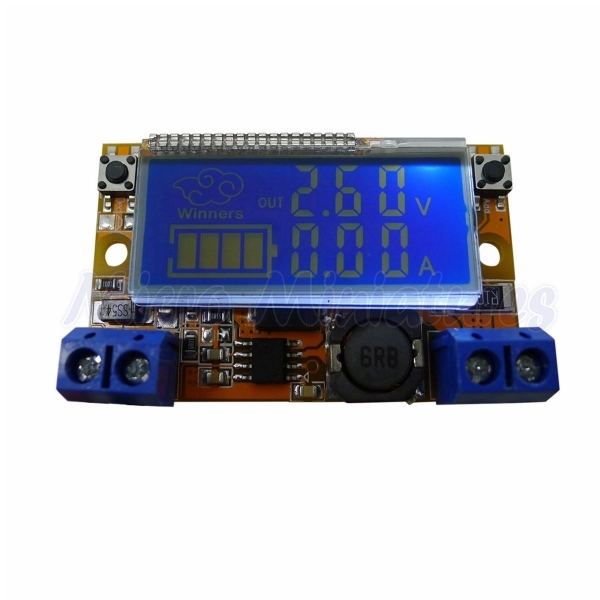 The condition of the input voltage is also displayed in the form of a battery indicator, making this unit suitable for use as a battery monitor in addition to a standard DC DC converter. Input and output connections are made by two 2 pin screw terminals. This DC – DC converter is ideal for many model railway applications as it can be used to reduce the main railway supply to voltages suitable for led and conventional lighting. It can also be used to form part of a hobbyist power supply and to monitor battery status.